What do we want from our biggest artists? The ones who are established beyond belief? How about some Audacity, with a capital ‘A’? 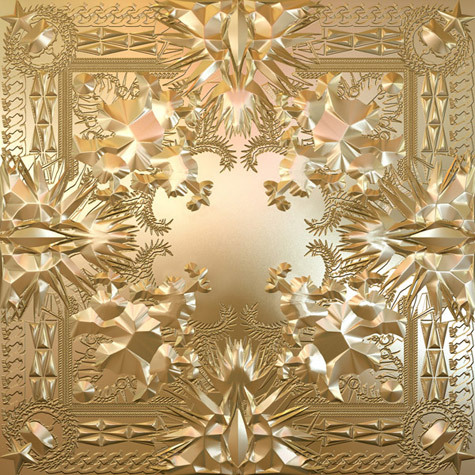 It’s right there in your face before you even open the packaging, with just the album’s name: Watch The Throne. But we’re not just dealing with royalty here; let’s shoot for something a little more. “What’s a king to a god? What’s a god to a non-believer?” Frank Ocean sings on “No Church in the Wild,” the album’s menacing opening track. A fitting introduction, because here are our gods, at least our gods of rap: Jay-Z and Kanye West, together, not for one or two tracks as a guest, but for a whole album. Let that sink in. What’s the equivalent of this in another genre? Back in the day, Keith Richards and Paul McCartney getting together, maybe. Or if Bruce Springsteen had been mentored by Bob Dylan. The term “super group” gets thrown around a lot these days, but sorry, Canadian indie bands or alt-country groups that mix and match members, this is an actual one. Behold The Throne; tremble at its power. Jay-Z: Ain’t that where the Heat play? Kanye: Ain’t that like Lebron James? Jay-Z: Ain’t that just like D-Wade…Wait. A new era is here, filled with rap artists willing to push boundaries, who expect themselves and their peers to do the unexpected. Lil’ Wayne makes a rock album, albeit a pretty bad one; Drake releases a hybrid speak-sing R&B/rap as his first single off his new album, so sensitive in his sweater vest. Frank Ocean, an unknown launched by his free online mixtape, nostalgia/ultra, is invited to collaborate with two living legends and then delivers a star-making turn. Then there is The Throne, still at the top, able to take a little bit of all of those trends and combine them into their own opus. There’s a clear rock influence on the beat of “Murder to Excellence,” a track highlighted by Kanye’s intense verse about the killings in inner city Chicago. There’s “Welcome to the Jungle,” where Jay-Z calls himself the Black Axl Rose over Swizz Beatz’s trademark stuttering snares. And as for sensitive, no one in the game does it better than these two. You can have your Drake and your The Weeknd; you can have your Trey Songz. But we’ll take the men behind “Lost One” and “Hey Mama” any day. It’s a touch of vulnerability in the sea of bravado, a human side to our superheroes, their Clark Kent moment, if you will. Isn’t it great when our gods, for all their accomplishments, are still like us?